Manganese is found in carbon steel and is also used in steel alloys. Small amounts of manganese are added to steel to improve the workability of steel at high temperatures. There is less than 1.65% by weight of manganese in carbon steel; whereas, special steels may have higher concentrations of manganese such as 8-15%. In addition, to restore the manganese lost by the heat during welding, manganese up to 15% by weight can also be used as flux agents in electrodes used in shielded metal arc welding (SMAW) and flux-cored arc welding (FCAW) (Taube, 2013; Villaume et al., 1979). Potential adverse effects of manganese include damage to the lungs, liver, kidney, central nervous system (CNS), and an elevated risk of male infertility. Potential neurological effects appear to be the most sensitive adverse effect. Prolonged occupational exposure to concentrations more than one milligram per cubic meter (mg/m3) has been associated with an increased risk of neurological disorders and the development of a form of Parkinsonism known as manganism (Taube, 2013; Montgomery, 1995; Feldman, 1999; Kirkey et al., 2001; Olanow, 2004; Sriram et al., 2010). Recent studies suggest that chronic exposure to manganese below 0.5 mg/m3 leads to subtle effects on learning, memory, behavior, tremor, weakness, reduced hand-eye coordination, and psychological impairments (Taube, 2013; Fitsanakis et al., 2006; Klos et al., 2006; Aschner et al., 2007; Bowler et al., 2007; Wastensson et al., 2012). 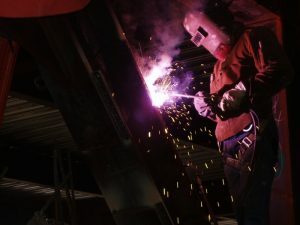 In the case of welders, neurological and neurobehavioral deficits, such as changes in mood and short-term memory, altered reaction time, and reduced hand-eye coordination may occur when workers are exposed to levels of manganese less than 0.2 mg/m3 in welding fumes (Taube, 2013; Olanow et al., 1996; Pal et al., 1999). Iron (another common constituent in welding fumes) and manganese share many biological protein transporters. Iron is crucial for the absorption of manganese – an increased uptake of manganese is associated with anemia, whereas, an excess of iron in the body has been found to suppress the uptake of manganese (Fitsanakis et al., 2006; Heilig et al., 2006; Thompson et al., 2006). Workers with iron deficiency may therefore be at greater risk of manganism than workers with higher iron levels. The biochemical relationship between iron and manganese likely contributes to the controversy regarding the role of inhaled manganese in the causation of neurological effects of populations (such as welders) that have concurrent exposures to both iron and manganese (Furbee, 2011). Occupational airborne exposures are evaluated by comparing sampled concentrations to Occupational Exposure Limits (OELs) such as the Permissible Exposure Limits (PELs), Threshold Limit Values (TLVs), and Recommended Exposure Limits (RELs). The PELs are published and enforced by the Occupational Safety and Health Administration (OSHA) as legal standards. The TLVs are established by the American Conference of Governmental Industrial Hygienists (ACGIH) as recommended industry standards. The TLV-TWAs are time-weighted average concentrations for a normal 8-hour workday or 40-hour workweek to which nearly all workers can be repeatedly exposed, day after day, without adverse health effects. The RELs are recommended exposure limits that are established by National Institute for Occupational Safety and Health (NIOSH) and are based on 10-hour workday schedules. The TLVs and RELs are not enforceable by law, but are typically based on more recent research studies than the PELs. Research began on better sampling approaches for particulates in the 1980s. In 1984, ACGIH established particle size-selective (PSS) criteria. Prior to this time, the only substance that had a TLV based on a particle size distribution was crystalline silica, which was based on respirable fractions. New international criteria for PSS was proposed in 1989 and ACGIH subsequently revised its PSS criteria in 1993. Particles are separated into three categories based on their size distribution – inhalable, thoracic, and respirable particulate matter (RPM). Inhalable particles include larger particles that are typically trapped by the nose, throat, and upper respiratory systems when entering the body but also includes thoracic- and respirable-size particles, if present. Inhalable has a median “cut-point” of 100 µm, which is the aerodynamic equivalent diameter (AED) when the collection efficiency of the sampling device drops to 50%. Thoracic particles have a median AED of 10 µm and may be deposited anywhere within the lung airways and the gas-exchange region. Respirable particles have a median AED of four µm and may be deposited in the deepest portion of the lungs (ACGIH, 2015). Virtually, all manganese is absorbed from particles deposited in the fine, gas-exchanging regions of the lungs. Thus, the particles of greatest concern are the fine respirable fraction, mostly those less than four microns (ACGIH, 2013). When welding bare, uncoated carbon steel material, manganese is the metal fume constituent that is most likely to exceed the TLV. In December 2012, ACGIH adopted two, 8-hour TWA TLVs for manganese, which changed the TLV from a TWA limit of 0.2 mg/m3 to 0.02 mg/m3, respirable particulate matter. The current TLV-RPM is based on reducing the potential for preclinical, adverse, neurophysiological and neuropsychological effects in manganese-exposed workers (ACGIH, 2013). This TLV is 1.5 to 2.0 times lower than the range of Lower Observed Adverse Effect Level (LOAEL) values observed (0.03-0.04 mg/m3). According to a statistical model of Roels et al. (1992), a level of 0.02 mg/m3 (respirable aerosol) would lead to impaired hand steadiness (detected with subtle tests but not clinical) in 2.5% of workers. In addition to the TLV for respirable particulates, a TLV-TWA limit of 0.1 mg/m3 was added for manganese inhalable particulate matter. ACGIH established this TLV for IPM to provide some safeguard for intestinal absorption secondary to inhalation exposure, possibly absorption from more soluble particles deposited in the nasopharynx. OELs are used as guidelines in the control of health hazards and should not be used as fine lines between safe and hazardous concentrations. The best practice is to maintain the lowest practical concentrations of all atmospheric contaminants. OELs for manganese are listed in Table 1. I – Inhalable particulate matter, which has a median “cut-point” of 100 µm (i.e., 50% collection efficiency at 100 µm). mg/m3 – Milligrams of manganese per cubic meter of air. PEL – Permissible Exposure Limit enforceable by the Occupational Safety and Health Administration (OSHA). R – Respirable particulate matter based on a median aerodynamic equivalent diameter of 4.0 µm. REL – Recommended Exposure Limit established by the National Institute for Occupational Safety and Health (NIOSH). STEL – Short-term exposure limit. TLV – Threshold Limit Value established by the American Conference of Governmental Industrial Hygienists (ACGIH). TWA – Time-weighted average based on an eight-hour exposure period unless otherwise noted. The presence of specific metals and their compounds found in the fume depends on the physicochemical properties of the specific metals, such as vapor pressure and boiling point, but also on welding temperature, type of welding material, and the concentrations of metals in the electrode and welding material (Taube, 2013; Burgess, 1991). The relative concentration of elements in the fume is very different from that in the consumable because elements with lower boiling points such as fluorine and manganese are significantly enriched in the fume as compared to their concentrations in the consumable and parent metals (Taube, 2013; Stern et al., 1986). Average manganese levels in welding fumes reported by various studies ranged from 5-15% (Keane et al., 2010; Yoon et al., 2009; Berlinger et al., 2008; Hewett, 1983). The American Welding Society (AWS) reported a range of 0.2-10% manganese (AWS, 1979; Arnold, 1983; Burgess, 1985). More recently, Siert (2012) reported a range of 2-15% manganese in welding fumes but typically ranging from 2-8%. From manganese-rich hard-surfacing, hard-facing SMAW rods, the manganese content in the fumes can range from 30 to 60% (Taube, 2013). 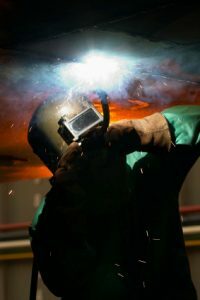 Several studies have reported the sizes of welding fumes. 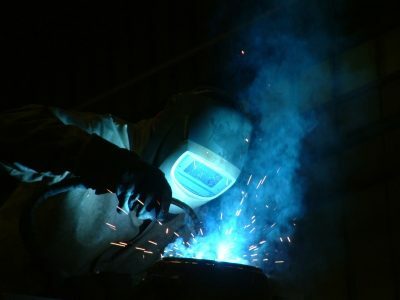 In general, welding fumes are comprised of sub-micron particles. FCAW and SMAW particles typically have a mean mass aerodynamic diameter (MMAD) of approximately 0.3 to 0.6 µm, whereas, gas metal arc welding (GMAW) fumes have a MMAD of approximately 0.2 to 0.4 µm. 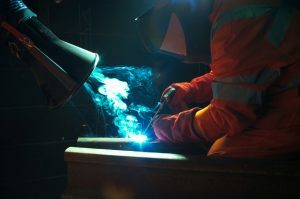 Welding fume particle sizes range from a few nanometers to 20 µm; however, less than 10% of GMAW fumes and 30% of FCAW fumes consist of particles larger than one µm. These larger fumes predominately consist as microspatter and likely do not get to the welder’s breathing zone (Taube, 2013). Historically, exposure monitoring for welding fumes have been conducted using 25-mm or 37-mm cassette filters, which have been commonly referred to as “total” dust sampling. However, a 50% AED “cut-point” was never established for these cassette filters; thus, this sampling method is not considered a particle-size selective sampling method and may not be appropriate to directly compare the results to OELs based on a specified particle size distribution. An Institute of Occupational Medicine (IOM) inhalable particle sampler has been designed to collect inhalable particles. However, there are no current studies that have validated the use of the IOM (inhalable) sampler to measure respirable portions of manganese fumes during welding. Jimenez et al. (2011) compared several sampling methods to develop a standardized method for sampling manganese. However, there was no direct comparison of the IOM dual sampler to the cyclone for the measurement of respirable manganese. Jimenez et al. (2011) recommended that the comparison is needed to validate the use of the IOM dual sampler for measuring respirable manganese. Studies show considerable differences in the results from various particulate samplers when sampling the very same dust under the identical environmental conditions. The traditional 25-mm and 37-mm cassette filters were not designed to represent a “physiological relevant exposure” to the respiratory system. Aspiration efficiency is not very similar to the nose and mouth. They are also not 100% efficient in collecting all sizes of dust particles. They have an upper size limit of approximately 20 to 30 microns where efficiency falls to zero (Anthony, 2011). Dust deposition on the walls of cassettes also presents an underestimation of the PNOS results. Conversely, the IOM sampler tends to overestimate particulate concentrations in low wind speeds and when large particles are present. 1. There is no significant difference in manganese TWA airborne concentrations between IOM and “total” particulate sampling results. 2. There is no significant difference in manganese TWA airborne concentrations between “total” and respirable particulate sampling results. 3. The predominant source of airborne manganese in welding environments is the manganese-enriched fumed. Allied processes such as grinding and deslagging activities are not significant contributors to airborne manganese in welding environments. 4. Although a low amount of manganese is contained in mild steel consumables, manganese is enriched in welding fumes since manganese has a low boiling point and high vapor pressure making it more volatile than other metals contained in the welding electrodes and base material. 5. TWA airborne concentrations of manganese from welding tasks frequently exceed ACGIH’s respirable TLV of 0.02 mg/m3. ACGIH. (2013). Documentation of TLV for Manganese, Elemental and Inorganic Compounds. Cincinnati, OH: ACGIH. ACGIH. (2015). Threshold Limit Values and Biological Exposure Indices for Chemical and Physical Agents. Cincinnati, OH: ACGIH. Arnold, R. (1983). An Investigation of Welder Exposure to Welding Fume in a Large Maintenance Workshop. Australian Welding Journal, Winter, 14-18. Aschnerm, M., Guilarte, T., & Schneider, J. (2007). Manganese: Recent Advances in Understanding ints Transport and Neurotoxicity. Toxicology Appl. Pharmacol., 221, 131-47. AWS. (1979). Effects of Welding on Health. Miami, FL: American Welding Society. Berlinger, B., Ellingsen, D., & Naray, M. (2008). A Study of the Bio-accessibility of Welding Fumes. J. Environ. Monit., 10, 1448-53. Bowler, R., Roels, H., & Nakagawa, S. (2007). Dose-Effect Relationships between Manganese Exposure and Neurological, Neuropsychological and Pulmonary Function in Confined Space Bridge Welders. Occupational Environmental Medicine, 64, 167-77. Burgess, W. (1985). Welding. In W. e. Burgess, Recognition of Health Hazards in Industry: A Review of Materials & Processes (pp. 167-204). New York: John Wile & Sons. Burgess, W. (1991). Potential Exposures in the Manufacturing Industry – Their Recognition and Control. In G. Clayton, & F. e. Clayton, Patty’s Industrial Hygiene and Toxicology (pp. 595-674). New York: John Wiley & Sons. Feldman, R. (1999). Manganese: Occupational and Environmental Neurotoxicology. New York: Lippincott-Raven Press. Fitsanakis, V., Au, C., & Erikson, K. (2006). The Effects of Manganese on Glutamate, Dopamine and Gamma-Aminobutyric Acid Regulation. Neurochem International, 48, 426-433. Furbee, B. (2011). Welding and Parkinsonism. Neurol. Clin., 29, 623-40. Heilig, E., Thompson, K., & Molina, R. (2006). Manganese and Iron Transport across Pulmonary Epithelium. American Journal of Physiological Lung Cell Mol. Physiol., 290, L1247-59. Hewett, P. (1995). The Particle Size Distribution, Density, and Specific Surface Area of Welding Fumes from SMAW and GMAW Mild and Stainless Steel Consumables. American Industrial Hygiene Association, 56, 128-35. Jenkins, N., Pierce, W., & Eagart, T. (2005). Particle Size Distributions of Gas Metal and Flux-Cored Arc Welding Fumes. Welding Journal, 84(10), 156-63. Jimenez, A., Galea, K., Searl, A., Spankie, S., MacCalman, L., Cherrie, J., & Tongeren, M. (June 2011). Development of a Standardised Method for Measuring Manganese Exposure. World Health Organization Collaborating Centrre for Occupational Health. Keane, M., Stone, S., & Chen, B. (2010). Welding Fumes from Stainless Steel Gas Metal Arc Processes Contain Multiple Manganese Chemical Species. J. Environ. Monit., 12, 1133-40. Kirkey, K., Johnson, C., & Rybicki, B. (2001). Occupational Categories at Risk for Parkinson’s Disease. American Journal of Industrial Medicine, 39, 564-71. Klos, K., Chandler, M., & Kumar, N. (2006). Neuropsychological Profiles of Manganese Neurotoxicity. European Journal of Neurology, 13, 1139-41. Montgomery, E. J. (1995). Heavy Metals and the Etiology of Parkinson’s Disease and Other Movement Disorders. Toxicology, 97, 3-9. Olanow, C., Good, P., & Shinotoh, H. (1996). Manganese Intoxication in the Rhesus Monkey: A Clinical, Imaging, Pathologic, and Biochemical Study. Neurology, 46, 492-8. Pal, P., Samii, A., & Calne, D. (1999). Manganese Neurotoxicity: A Review of Clinical Features, Imaging and Pathology. Neurotoxicology, 20, 227-38. Roels, H., & Lauwerys, R. (1992). Health Risk Assessment of Chronic Exposure to MnO2 Dust: An Epidemiological Study in a Battery Plant. Symposium on Manganese Toxicity. Paris, France: International Manganese Institute. Roels, H., Ghyselen, P., & Buchet, J. (1992). Assessment of the Permissible Exposure Level to Manganese in Workers Exposed to Manganese Dioxide Dust. British Journal of Industrial Medicine, 11, 25-34. Siert, A. (June 19, 2012). Flux-Cored Arc Welding Exposures in Electric Power Generation and Fume Components. Roundtable Session No. 221 – Welding Exposure Assessments and Exposure Database Design. Indianapolis, IN: American Industrial Hygiene Conference & Exposition. Spear, J. (June 1, 2015). The Viability of Particle Size-Selective Exposure Assessment for Welding and Allied Processes. Roundtable Session No. 210 – Welding Fume Generation, Exposure Monitoring, Assessment and Control. Salt Lake City, UT: American Industrial Hygiene Conference & Exposition. Sriram, K., Lin, G., & Jefferson, A. (n.d.). Mitochondrial Dysfunction and Loss of Parkinson’s Disease-Linked Proteins Contribute to Neurotoxicity of Manganese-Containing Welding Fumes. FASEB Journal, 24, 4989-5002. Stern, R., Berlin, A., & Fletcher, A. (1986). Summary Report, International Conference on Health Hazards & Biological Effects of Welding Fumes & Gases. International Arch. Occupational Environmental Health, 57, 237-246. Taube, F. (2013). Manganese in Occupational Arc Welding Fumes: Aspects on Physiochemical Properties, with Focus on Solubility. Annals of Occupational Hygiene, 57(1), 6-25. Thompson, K., Molina, R., & Donaghey, T. (2006). The Influence of High Iron Diet on Rat Lung Manganese Absorption. Toxicol. Appl. Pharmacol., 210, 17-23. Villaume, J., Wasti, K., & Liss-Sutter, D. e. (1979). Effects of Welding on Health. Miami, FL: American Welding Society. Wastensson, G., Sallsten, G., Pettersen, R., & Barregard, L. (2012). Neuromotor Function in Ship Welders after Cessation of Manganese Exposure. International Arch. Occupational Environmental Health, 85, 703-13. Werner, S. (1996). Investigation into the Impact of Introducing Workplace Aerosol Standards Based on the Inhalable Fraction. The Analyst, 121, 1207-14. Yoon, C., Paik, N., & Kim, J. (2009). Total and Soluble Metal Contents in Flux-Cored Arc Welding Fumes. Aerosol Science and Technology, 6, 511-21.